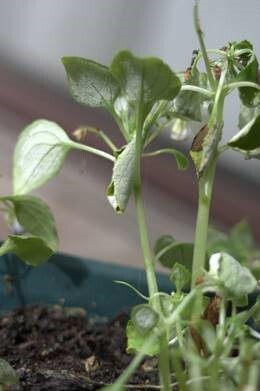 Disease: Downy mildew – various genera including Peronospora, Plasmopara, Bremia and others. Symptoms: Symptoms vary on different plant hosts and include spots on leaves, stems and flower stalks which may range in colour from light green to yellow or red. The upper leaf surface can show chlorotic (yellow) patches, while the typical downy grey fungal growth can be seen (under humid conditions) on the underside of these patches. Severe infections can lead to leaf drop, shoot dieback and leaf rosetting. The infection can become systemic in some hosts causing stunting and yellowing of growing tissues. Transmission: Air-borne spores are produced at night, generally on the undersides of leaves, and released in the morning as the air dries out. These spores are short lived and need water to germinate. The fungi can survive on contaminated soil, plant debris, seed or other propagating material and on weed hosts. Favoured by: Leaves that are wet for long periods, when humidity is high and the weather cool (temperatures of 4o – 27o C depending on host). Host range: Downy mildews occur on a wide range of hosts. Common on greenhouse rose and certain seedlings, for example, alyssum grown in crowded areas. An initiative of the Nursery Levy funded National Nursery Industry Biosecurity Program and ‘Building the resilience and on-farm biosecurity capacity of the Australian production nursery industry’ Project.